Back in the day (which we’ll call the 80s and 90s), the video store was, like TV before it, seen as the greatest threat to cinema by way of inviting you to stay home. Now, thanks to Netflix and other streaming services all but killing the notion of leaving the house at all or interacting with human beings for your entertainment, the beloved Video Rental Store is all but endangered, and remembered fondly. Netflix has created a tunnel vision where algorithm’s push you to ‘more of the same’ from a highly limited amount of titles. Also the risk factor is gone. Don’t like it? Screw it, flick to something else. With streaming, gone too are tens and tens of thousands of movies that will never reach one of these platforms, forcing movie fans toward illegal downloading. Couple that with highly unimaginative ‘thumbnails’, and even the spectacular VHS cover art (itself diminished somewhat with the advent of DVD) is being lost. Cinephiles are a devoted bunch, and are finding new creative ways to hold on, and introduce a new generation, to the simple joy of hunting down a movie, and making a choice based on cover art, and your gut. No algorithms, no intrusive privacy invasions to skew your viewing habits. Best of all, video stores allow you to engage with other movie fans, and you may end up with a film you’d never otherwise discovered. Below is our partial list of favorite video stores we like, some that now incorporate cafes and screening rooms, plus a map too to find your way to several more around the world! We have to open with this store, that opened in 1975 as the world’s first movie rental store, and holds the world record of the longest running video rental store that started with Super 8mm rentals.It has an enthusiastic following and incorporates small cultural events. One of the greatest video stores out there, Movie Madness is not just a video store with countless movies, but also a movie museum with original pieces of movie memorabilia. It’s a paradise for movie fans as their titles are not only arranged by genre, but also by film makers or actors. Also has quite the backing of famous faces like Bruce Campbell and director Alex Cox. Vidiots recently closed it’s Pico location and will be reopening soon in a new location. They continue to run screenings and events in the meantime. Using a model that should have been adopted long ago by video stores, Casa offers a service to search their directory online for in store pickup or like the Netflix DVD model, have it delivered by mail. Casa also has a bar upstairs from the store. Scarecrow is a vibrant indie video store that has a staggering back catalogue of over 130,000 titles. They even have plentiful merchandise and free screening nights. Being named after a David Cronenberg classic should be indication enough of how great this place is. Videodrome is the type of place you’ll find stacks of movies you never thought you’d love and they keep their New Arrivals walls stacked with the commercial stuff, but also plenty of cult and obscure. Home to plenty of film maker sections too. Home to over 20,000 titles, 20th Century Flicks also houses screening rooms where you can view movies. Like London’s Prince Charles Cinema, it’s a movie fan institution and run by cinephiles. Also listed on our cinema page, Film Noir moved to a larger store front (an old funeral home) to accomodate a screening room in the back. Film Noir is stacked with cult classics and hard to find, out-of-print DVD’s. They also sell VHS and vinyl. A great place to browse. Self proclaimed ‘Best Video Store In The World’, Eddie’s spot looks like a road side attraction. He also sells an extensive catalogue of movie stills, the type that used to populate entire movie poster / photos stores. We’re cheating a little, as this a movie retail store, but it’s a gem and a Melbourne institution that stocks incredible rare and hard to find titles. When your only other option is the retail giant JB-HiFi (that is still great for movie collectors) this place is a blessing for true cinephiles. You can also email to request a title. 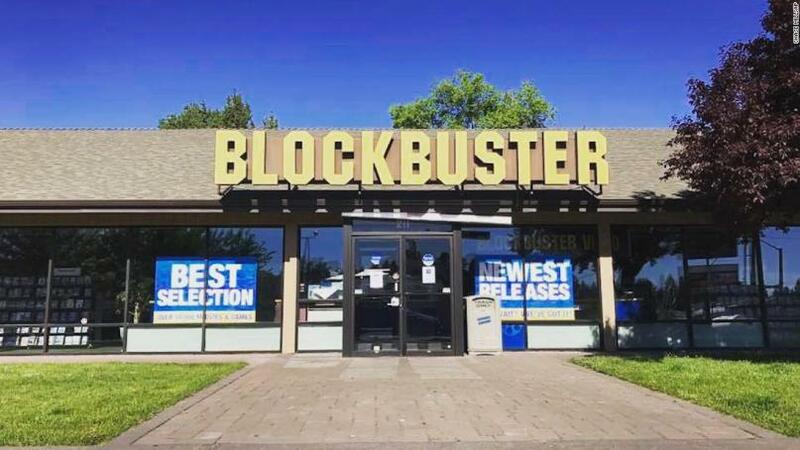 Bend, Oregon is home to the last Blockbuster in the U.S and is still thriving. It’s become a veritable tourist attraction and the subject of a feature length documentary. Use the map below to see the above stores and find plenty more around the world.